Yes, I’m about to be 27 years old and still having slumber parties! Okay, I guess I just used the term Slumber Party because it sounded better in the title. We didn’t sit around in our feetsy pajamas, braiding each other’s hair, prank calling boys, and eating cupcakes. We did sit around chatting, catching up, eating delicious food, drinking great wine, and even practiced some yoga. Now that I think about it there actually was some hair cutting (my roommate is a hair dresser) and of course there was boy talk. I guess some things never change. Even when I looked back to our last girl’s night, we pretty much did the same thing. I guess we’re just becoming more and more predictable in our older age. I had planned on grilling for the girls since we’ve been finally getting some warmer weather. Of course it was cold and rainy on Saturday, but that didn’t stop me! Grill I did! We had some big, juicy organic burgers minus the bun. 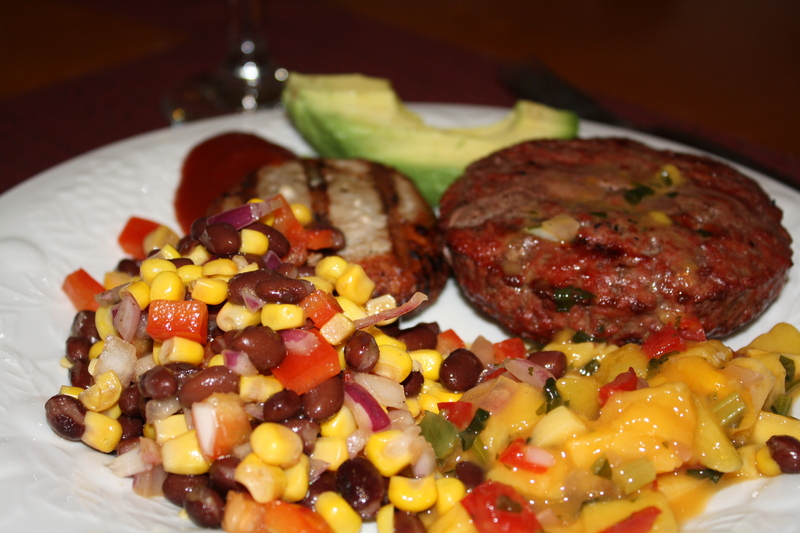 I put out mango salsa and avocado to top them with. My friend Caroline brought over a corn and bean salad that she got from Rachel Ray. 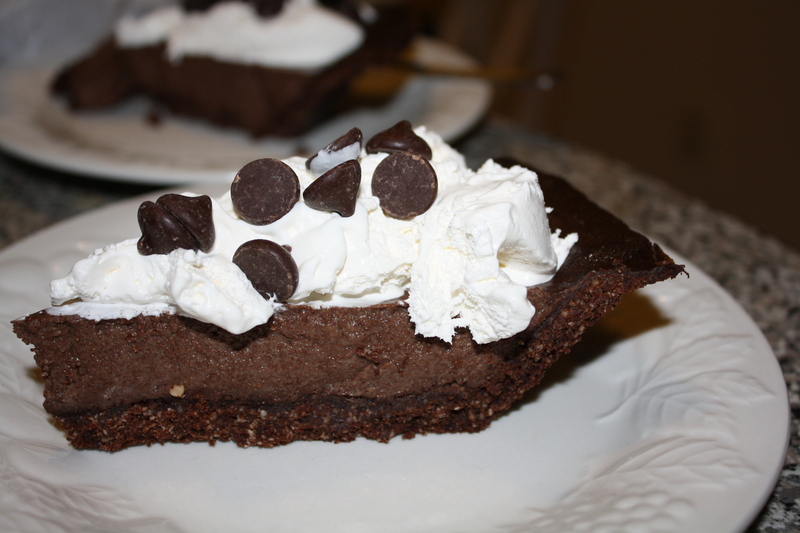 For dessert my friend Missy, who is an awesome cook and baker, made a to die for chocolate pie. Missy is paleo as well so her amazing dish came from a recipe from Danielle at Against All Grain. After stuffing our faces and drinking too much wine, I decided it would be a great time to practice my yoga teaching on the girls. That was fun! They gave me lots of good constructive criticism and tips on how to be more clear. Does anyone else still have “slumber parties” with their girl friends? I’m 31, and I love slumber parties! My girlfriends and I had a holiday slumber party last year for our annual year end get-together. When you have friends that live in different parts of the country, it’s a great way to plan a solid chunk of time to reconnect that’s low-key and easy on the budget. And that pie has now convinced me to get a copy of “Against all Grain.” Wish list! So true! I guess I forgot to mention that we don’t all live close so , yes a sleep over is a must! Against All Grain is definitely on my wish list too! Her website has a ton of good recipes too!